Do you live in a city with "coffee culture"? Those who do understand already what this term means, but in case you don’t … "coffee culture" to me means a city that has quality coffee shops with outdoor seating where people can gather over a good cup of coffee. They are social centers. I unfortunately live in a city that doesn’t have this, and so when I travel I tend to seek it out. When I lived in Sydney, I used to tell my friends that the coffee culture was so deep, even the "McLatte" from McDonalds was drinkable. Last week I was in Singapore, a city that definitely has coffee culture. The hotel I was staying at was the Swisshotel Merchant Court right near an area of Singapore called Clark Quay. There were no shortage of coffee shops in the area, but the most interesting manifestation of Singapore’s coffee culture for me was right in my own room on the 12th floor. 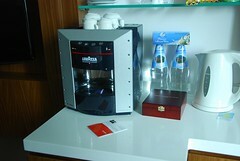 I have stayed in hundreds of hotel rooms but never had a high quality full cappucino maker in my room, until last week. For a business traveller stuck often dining on room service and working strange hours due to the 12 hour time difference between Singapore and DC … that coffee maker made a big difference during my four night stay. The area where Swisshotel is located is right next to many more legendary hotels in Singapore, including the Raffles Hotel (birthplace of the Singapore Sling and long considered one of the best hotels in the world). As with any other hotel, luxury or otherwise, they have the continual challenge of standing out amongst their competitors. They have the added challenge of not having as strong of a loyalty program as some of their big chain competitors such as Starwood, Hilton, and Hyatt. To lure business travellers away from their habits, you need to do something more. For Swisshotel, that’s through their cappucino makers that offer late night workers like me struggling to be awake and available during the working hours of our home offices a much needed moment of sanity. Check out the rest of my photo gallery from the SwissHotel Merchant Court … I’m thinking of startig a travel photography blog to finally realize my longtime ambition to have some kind of travel blog, but without having too much time to dedicate to it.